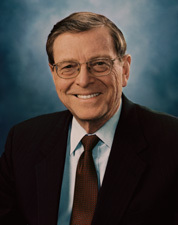 DOMENICI, Pete Vichi, a Senator from New Mexico; born in Albuquerque, Bernalillo County, N.Mex., May 7, 1932; graduated, University of New Mexico 1954; graduated, Denver University Law School 1958; admitted to the New Mexico bar in 1958 and commenced practice in Albuquerque; elected to Albuquerque City Commission 1966, chairman (ex-officio mayor) 1967; elected as a Republican to the United States Senate in 1972; reelected in 1978, 1984, 1990, 1996, and 2002, and served from January 3, 1973, to January 3, 2009; chair, Committee on the Budget (One Hundred Fourth through One Hundred Sixth Congresses, One Hundred Seventh Congress [January 20, 2001-June 6, 2001]), Committee on Energy and Natural Resources (One Hundred Eighth and One Hundred Ninth Congresses); was not a candidate for reelection in 2008; died on September 13, 2017. Domenici, Pete, et al., A Changing America: Conservatives View the 80s from the United States Senate. South Bend, Ind. : Regnery/Gateway, 1980.